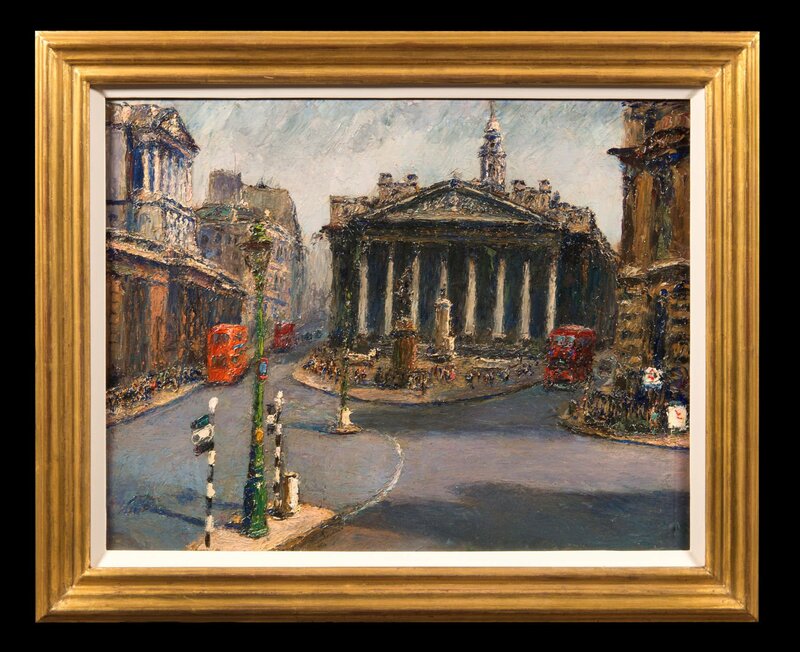 This beautiful painting shows the Royal Exchange from Mansion House, the official residence of the Lord Mayor of London. The iconic red routemasters are seen passing by the famous 1844 building with the statue of Wellington at its front. The artist once said that “London offers greater possibilities to the painter than any other city in the world, because of the light values in its unusual climate”. This interest in light is seen in London: The Royal Exchange, from the Mansion House with the early morning sunlight reflecting off the buildings and road. 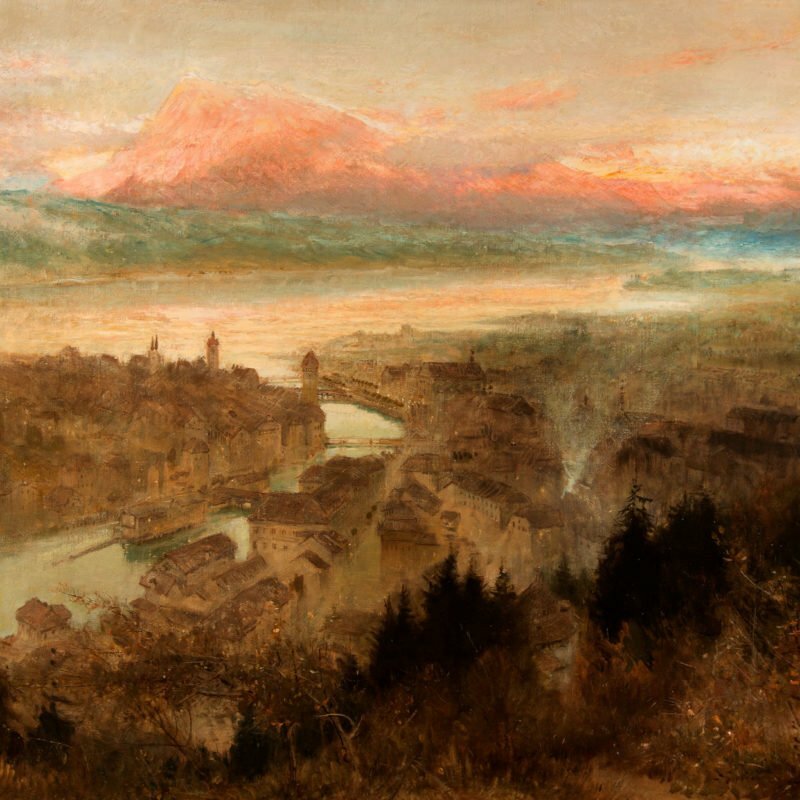 Sansalvadore, a violinist and writer, turned to painting later in his life and moved from his native Italy to England in the 1930s. 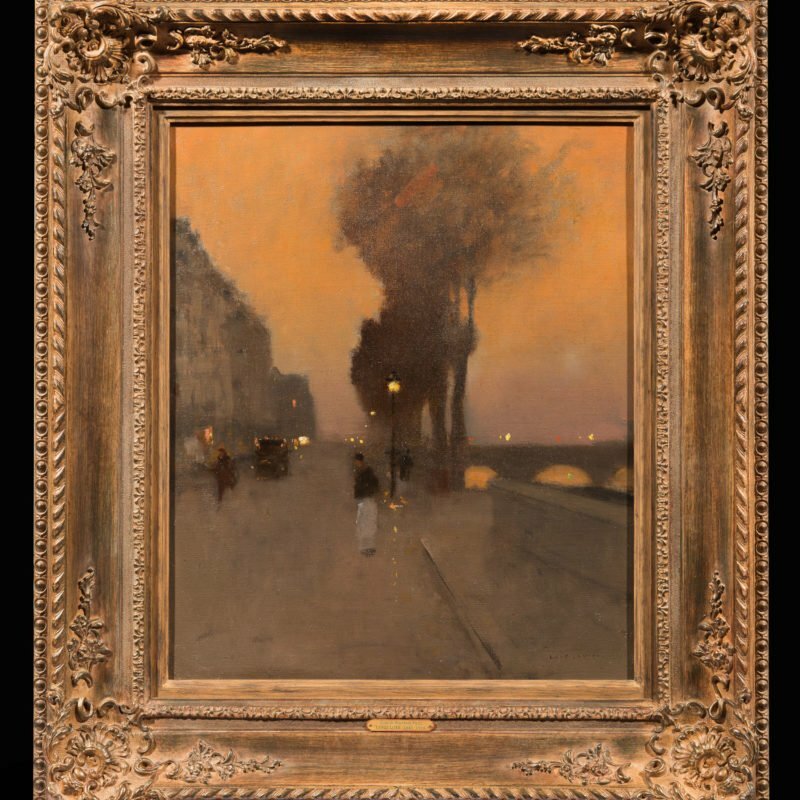 His work, often on a small scale, was influenced by French Impressionism. 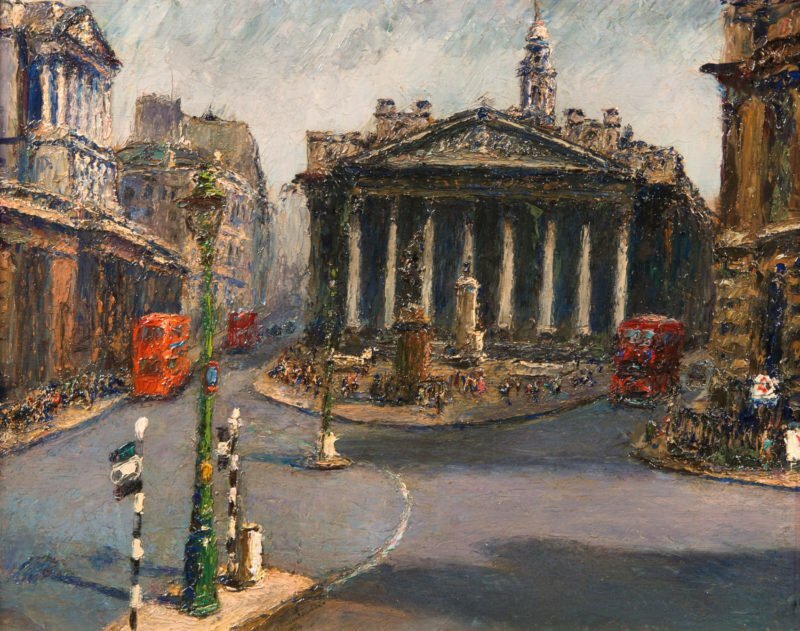 Sansalvadore painted landmarks and events throughout the United Kingdom during the war years and was commissioned by London City Corporation as a war artist. 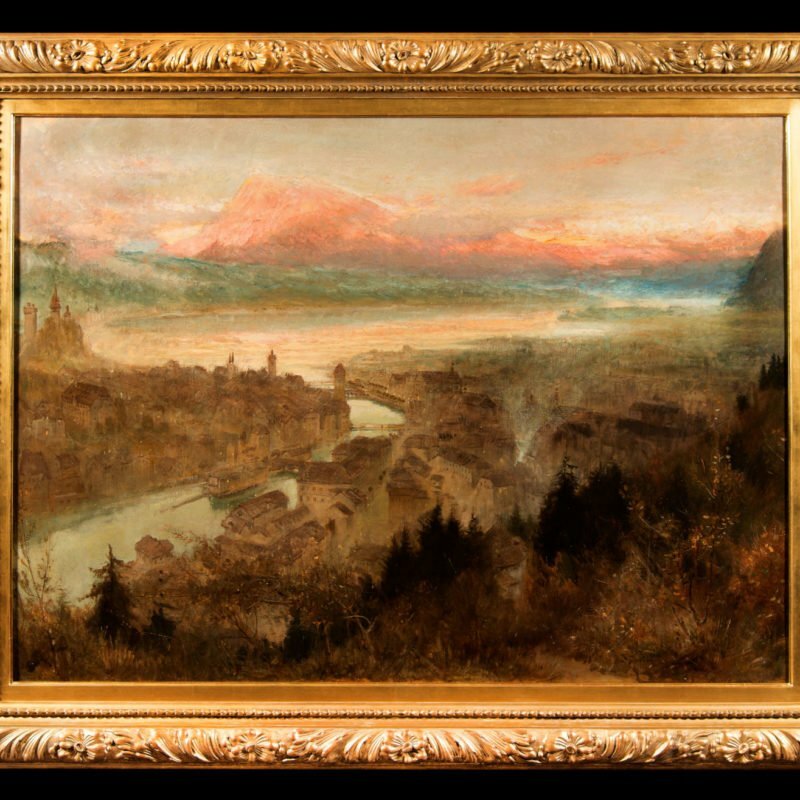 Sansalvadore could often be seen with his trademark artists hand cart in and around London. Four, small, impressionistic views of St Paul’s, Big Ben and Whitehall celebrating the Silver Jubilee of King George V are held in the Royal Collection Trust. “Ludgate Hill from St Paul’s” was purchased by Queen Mary at the exhibition of ‘New Paintings by Piero Sansalvadore’ at the Fine Art Society, London on the 15th December 1938.